Weekday mornings are hectic for most, but for those of us with school age kids, some days they can be absolutely manic. Enter the Goodbyn. An all-in-one lunch box with an alter ego: time saver. Kudos to those of you who are organized enough to make your lunches the night before. For the rest of us, get a Goodbyn lunch box. Reminiscent of an airline meal tray, the Goodbyn has six different compartments to keep food separate and one lid to seal them all up. That's the secret - one container, one lid. No longer will you spend precious morning minutes hunting and low for appropriate-sized containers - and their lids - to fit the various parts of little Billy's lunch. Or even better, having a container in hand and trying to figure out what you have in the fridge that will fit into it. with nearly 300 stickers for your child to personalize his or her own lunch box. Simply open up the Goodbyn, put it on the counter and start filling the various compartments with whatever little Susan loves to eat. 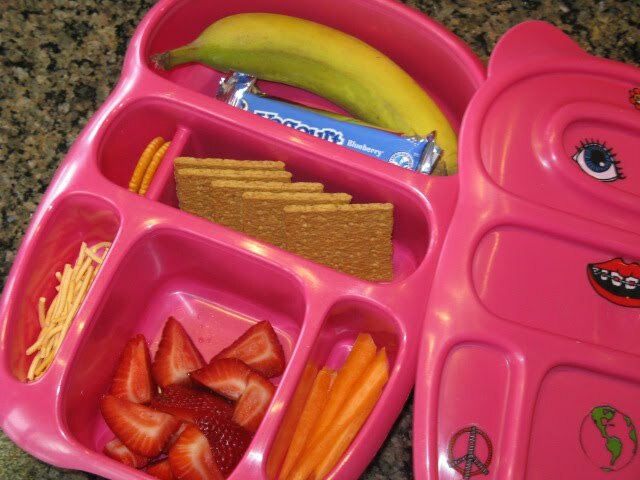 Grab that box of crackers, cereal, cookies and throw a handful in whichever compartment you like. Put a sandwich in the big one or a wrap in the long one. A banana and granola bar in the top one and raisins in the smallest one. Put grapes in one side compartment and carrot sticks in the other. It feels like you're emptying your cupboards and fridge into this one lunch box. It's so easy - and quick! Plus you'll realize there's no need to buy all those pre-packaged snacks with all their disposable wrapping. We highly recommend the Goodbyn lunch box. Not only is it BPA, lead, phthalate-free, made responsibly in the USA out of dishwasher-safe, recyclable material and helps cut down on waste, but it's been pivotal in ensuring we avoid getting that late slip on far more than one occasion. Goodbyn Lunch Box Sale: Save 20% on Goodbyns this Victoria Day weekend at online eco boutique Lavish & Lime. Choose from four bright colours: pink, blue, orange and green. Offer ends midnight, May 24th - limited time only! If you have Goodbyn story, please leave a comment below and tell us about it. We'd love to hear from you!